Watch the video to see how the Early Riser Planter provides these agronomic benefits in this demonstration compared to a conventional row unit. Regardless of your speed, seed size or field condition, the Case IH Advanced Seed Meter (ASM) is equipped for the job. We spent hundreds of hours in field testing, with all types of seed combinations, to provide you with the best in seed delivery. Reliably delivers seed of any size, type or any coating with simple settings that do not require frequent adjustments. Best-in-class mini-hopper for unmatched seed flow control during normal field operations. Advanced Farming Systems (AFS) from Case IH help you reduce overlaps and skips, manage inputs by prescription, as well as monitor planter performance, all from one display. Plus, receive 24/7/365 access to service and support through the AFS Support Center. Choose between the standard Early Riser IV monitor with mechanical seed drive for basic monitoring functions or the optional AFS Pro 700 control center for precision control. Provides immediate seed sensing and pinpoints singulation, skips and multiples. Compares quality of spacing between populations. Available for corn, popcorn, sugar beets and sunflower crops. 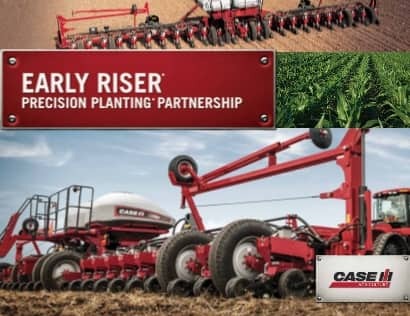 Case IH has partnered with Precision Planting to offer technologically advanced options - equipping planters with select components, all on the same toolbar, to control residue management, seed placement ​and down-force control row by row. 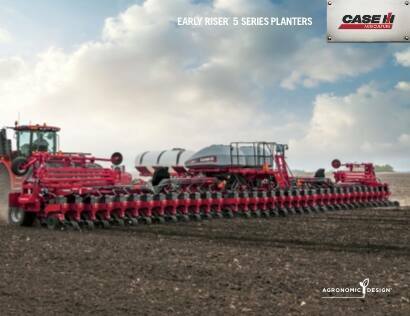 Case IH Early Riser planters are built strong to work as hard as you do, all day long and over multiple planting seasons. And they’re designed to be nimble and flexible, with fewer and easier adjustments and less daily maintenance. New features, like our AccuDrive cable seed meter drive system and redesigned bulk fill system with improved seed handling capabilities, bring more uptime, reliability and agronomic benefit than ever before. ​Configure and price your new Early Riser Planter Series. Customize it the way you want.